The West is divided, most of its citizens still willing, despite all we now know of the wars on the middle east, and despite the unproven and frequently risible nature of a litany of allegations of Russian wrongdoing1 – despite too the word ARMAGEDDON dancing in day-glo yellow on the black top highway our rulers want to take us down – to see in Putin the devil in human form. Willing to believe, in fact, something more far-fetched still: that Russia vexes Washington and its junior partners not by her disruption of their game plan for Syria, targeted before Daraa 2011 as next in line for regime change. Nor by her challenge, along with China’s, to a fiscal, economic and military supremacy that since the fall of the Soviet Union has allowed America to bully and privatise a unipolar world. No, despite all that’s come to pass since the Berlin Wall fell, since Yugoslavia was rebalkanised and the cradle of civilisation shelled back into the middle ages with depleted uranium, millions of amnesiacs in the West – some with foreboding, some in righteous fury, a few with a show of tired cynicism they mistake for scepticism – say we must stand up to Russian aggression. This we being a West that flouts international law in the name of its War on Terror, the kindest view of which is that it has failed abjectly – putting you and me at greater not lesser risk – and a more factually aligned view that its ambivalence and double dealing are entirely of a piece with a century of playing with Salafist fire, the better to destabilise elected governments who would have their oil fund development at home rather than enrich BP shareholders. In the name too, testing our credulity to breaking point, of humanitarianism. … a West that made Africa’s richest country – with levels of welfare, literacy and prosperity to match – the carved up fiefdom of warlords in the business of slavery, people trafficking and the quartermastering of terror. This we being a West whose best efforts to consign Syria to the same fate – for reasons amply documented2 – were thwarted only because Putin, rebuilding Russia’s economy after a supine and rarely sober Boris Yeltsin had overseen its descent into basket case status, now felt strong enough, and sufficiently alarmed by a game plan read more accurately in the Kremlin than in Western liberal circles, to throw a spanner in the NATO works. And let’s not forget – though there’s much I must overlook for brevity’s sake – the proxy war on Iran this same we is waging through Riyadh: its F-16s and Tornados terrorising Yemen as I write, on NATO’s behalf3 and to boosted bottom lines in the death-for-profit sector. Then there’s Israel, world’s premier ethnographic crime scene and, alongside the USA, its most serial breacher of international law. Also – a fact insufficiently appreciated by a pro-Palestinian lobby understandably focused on immediate injustices – up there with Saudi Arabia as regional enforcer, covert and overt, for the West. Time and the demands of brevity, not dearth of material, are all that prevent a longer list of the crimes committed by this we – product of cynically manufactured consent – now being urged to ‘stand up to Russia’. In stark contrast to those blind to such realities, a small but growing minority views the taking at face value of Russia’s demonisation as akin to flat-earthism and lizard worship, but without the common sense component. 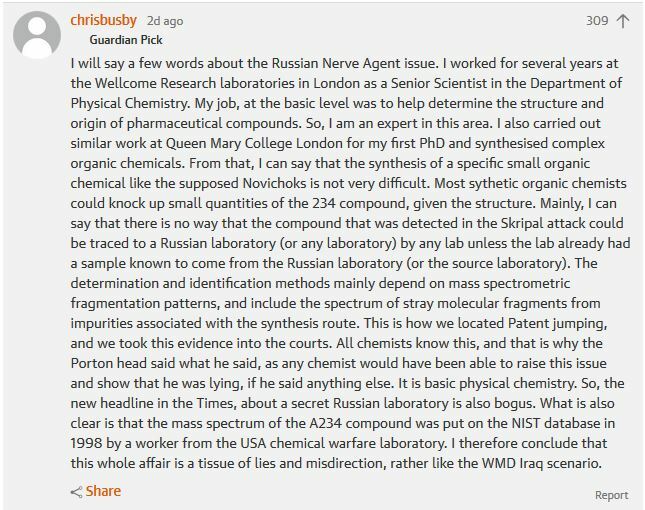 When a Guardian Editorial of April 5 referred without irony to Russia waging a “propaganda and disinformation war on all fronts”, it drew a withering BTL response – the Graun having, unusually these days for such a piece, opened it for comment. In comes strongman Putin. He cracks down on corruption (but must play a long game, so is with breathtaking chutzpah accused of deeds done by his predecessor to nods of approval in Washington). He fixes a torched economy, allowing him among other things to beef up defence – now why would he want to do that? With Russia once more a global player, he stands up to NATO and effects rapprochement with China, in part discussed in Perilous Days. All this, mind, coinciding with the slow economic decline, making it triply dangerous, of the most powerful and reckless nation on earth. Still wondering why there’s a cold war on Russia? In other words, what we are told about Putin by our politicians and corporate media (BBC too, thanks to its dependence on governments fearful of Murdoch and Mail) is not just likely to be false in substance. It is in any case not why they loathe him. For that, we should disregard the blather on doped athletes, rigged elections and SMERSH style assassinations. 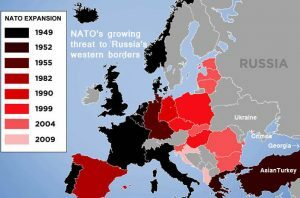 Disregard too the constant refrain of Russian aggression around the Black Sea – easily seen for the nonsense it is from the map below. 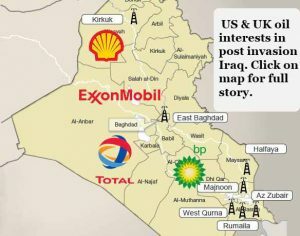 We should look instead to China’s declared intent (with Russia fully briefed) to abandon petro-dollars and buy oil in gold backed renminbi, to BRICS commitment to China’s Belt and Road project (context for, among other things, the pipeline aspect of the West’s dirty war on Syria) and to Sino-Russian partnership on the IMF spooking Asian Infrastructure Investment Bank. My post was neither sophisticated nor comprehensive. It set out, in six paragraphs – eight if we include two half-liners – a punchy summary of (a) why there was cold war on the USSR, (b) why it didn’t end with the latter’s demise and (c) how so rude and rapid a derailment of the Donald’s avowed intent to work with Russia shows this upstart of low political capital and lower political nous to have misread the strength of deep state resolve. Though it lacks nuance, I stand by my piece as corrective to the reality inversions sold and, alas, widely bought on Russia. As corrective too to the painfully narrow perspective of those who say the world would be a better place under Clinton, and seem genuinely if peevishly at a loss as to how others who share many of their values, principles and even postcodes, but not that view of her as lesser evil, could fail to see it their way. Ditto a greater delusion yet – that it was a better place under Obama. Why, in the face of counter evidence from every continent of a blood-soaked, embargo starved planet, do they so insist? Because (a) they’re not taking in the global picture, just the view from Manhattan or Islington, and (b) their understanding is deeply idealist rather than materialist. The difference? Idealists listen to the used-car salesman, as if to an impartial and disinterested source, before handing over their hard earned. The materialist also listens (with sharp eye and ear for dissemblance) but then has a trusted expert of her choice lift the bonnet for a good look at the innards. We should do likewise. Part two will set out a materialist understanding of history, part three returning to the specific combination of factors and circumstances currently driving the West’s hostility to Russia under Vladimir Putin. As with allegations against Assad, these are doubly leveraged. First they are elevated by sheer repetition from accusation to (seemingly) proven status. Then, despite their (actual) unproved or even disproved status, they are used as ‘yet agains’ to prop up new allegations. 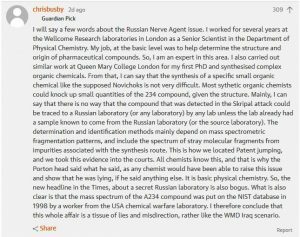 Just as claims of Assad using sarin in 2013 gave traction to those re Khan Sheikhoun, 2017, so do unproven charges re Litvinenko and Politkovskaya add weight, for the credulous, to accusations re the Skripals. In sum: privatise Syria’s state capitalism, force through the West’s preferred pipeline, lock out Russia (and disrupt China’s Belt and Road project) and above all preserve US regional hegemony by safeguarding Israel and isolating Iran (next for regime change had Syria gone to plan). Two reasons Saudi Arabia attacks Yemen, and through it Iran: (a) the Shia state is as loathed and feared by House of Saud as by Zionism, (b) the war is what Washington wants but can’t take the heat for right now. Reagan thought the cold war over in 1989, Yeltsin that appeasement was Russia’s best policy. But Clinton, Bush and Obama continued NATO enlargement to the dismay of Reagan appointees Paul Craig Roberts and Stephen Cohen, and of ‘political realist’ John Mearsheimer. A supremely well written and straightforward historically accurate assessment of what is an expansive and all encompassing subject matter. Keeping the format to the essentials and relevant details without digressing into nuanced side plots and machinations, which is all too often the result of intellectuals trying too hard to include all their acquired knowledge and information, yet still managing to include the pertinent details, is quite a feat for any attempted summary of events and consequences. I should imagine Naomi Kline would find this a very commendable effort. Klines books are intense and lack nothing of any consequence but are not a casual read. This, however, is informative, interesting and a really good read. As ever you’re too kind Susan – but thanks all the same!